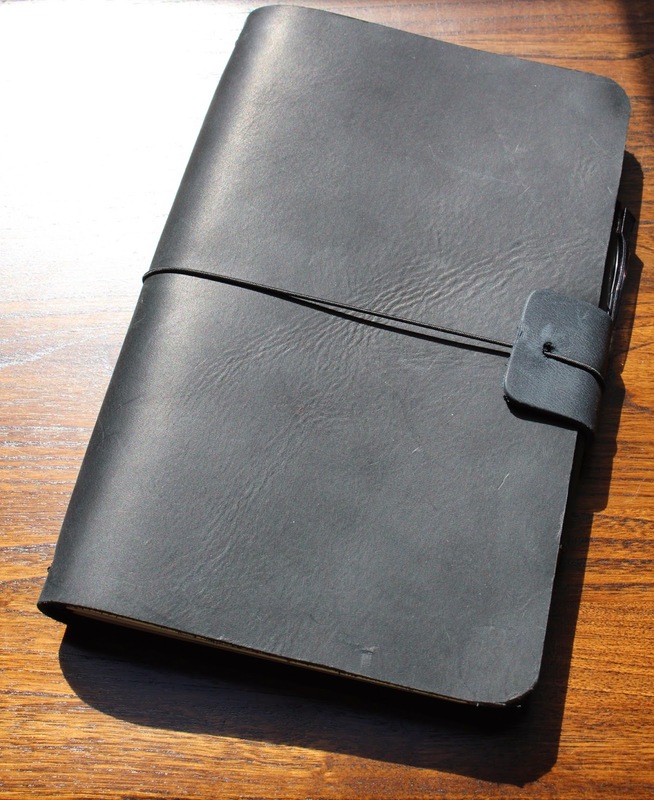 I’ve been using a regular size Travellers Notebook for a few months now with Moleskine Cahiers cut down in width as described by Ray in his video here. 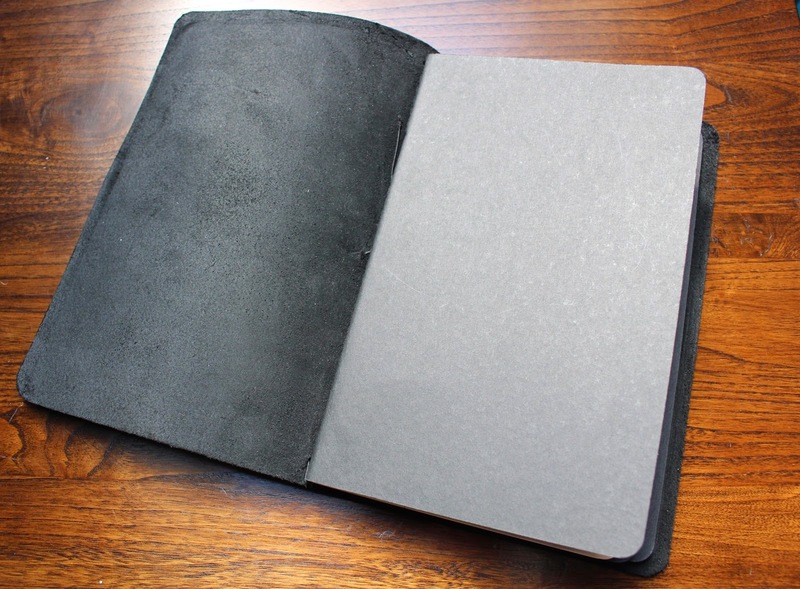 That isn’t too difficult to do, but I liked the idea of having a cover that was the correct size for the notebooks without having to trim them down in width. 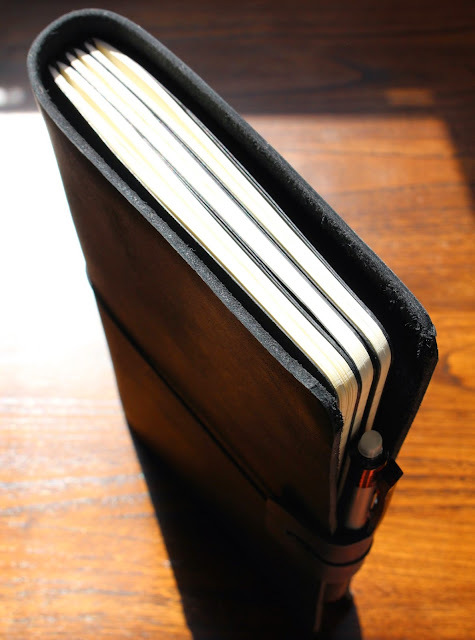 After looking around at the various options from various sellers I noticed there was quite a bit of variance in the prices and the sizes quoted for regular size and full size cahier size Travellers Notebook covers. In the case of anything made in the USA I would also have to factor in import tax, VAT, shipping etc. So after considering everything I thought about making one of my own. Once again I followed the method used by Ray in another of his videos, but made it bigger. So how did I size it? Moleskine sell their cahier notebooks in packs of three, so making it take three was an obvious choice, but if I make a bit bigger to be able to take a couple more that would be great. So I stacked three notebooks together and measured from the back to the front and added on 10mm to allow some over hang which would then allow for extra notebooks. To punch the holes for the elastics I bought a couple of leather punches via Amazon which arrived in the post. The advantage of using a hollow punch is that the holes are nicely finished off. 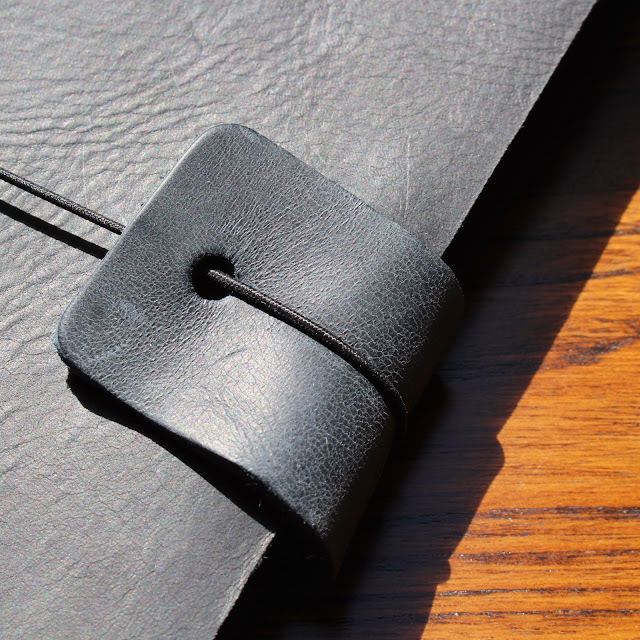 I followed Ray’s video on how to measure and punch the leather and then how to thread the elastics… something I had had practice at doing when I helped to develop the Travellers Notebook cover at Van der Spek in October last year. I also rounded the corners using a sharp craft knife and a large washer as a template. I’m really pleased with the end result. 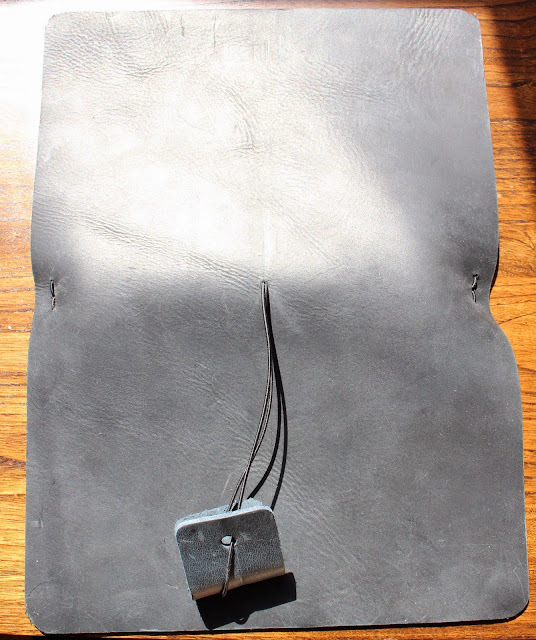 The leather supplier also sent me some other samples and I used one the same as the leather for the cover to make a pen holder on the closure elastic. I’m quite proud of the result, I will certainly consider making some others should I get the need to try a different size. 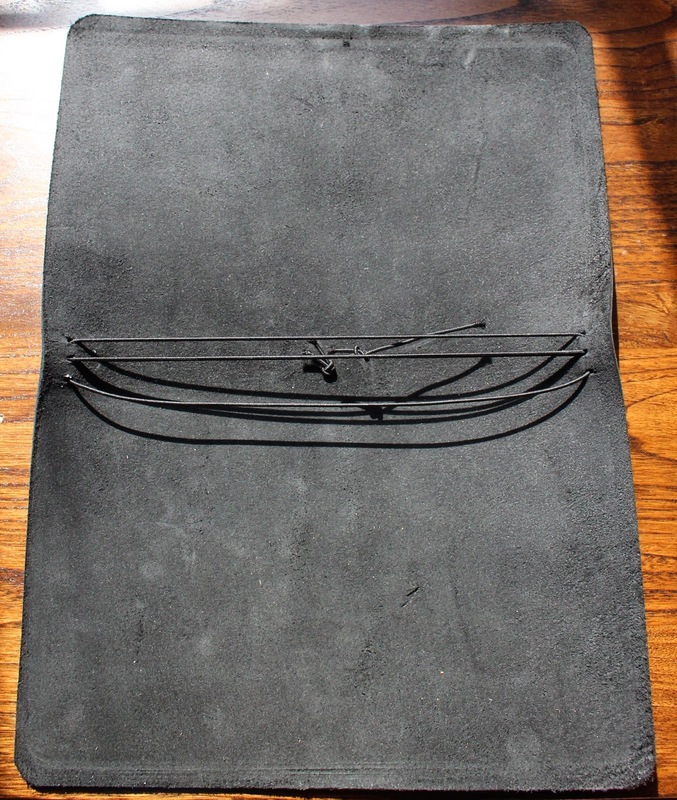 Have you tried making your own Travellers Notebook cover yet? Looks great Steve! I am curious to know what you are going to use on your trip to the States? You have many choice! Want to do a sneak preview now, or wait and get some blog mileage out of that? Looking forward to your Denver visit! Can I ask what size punch you used? I have the leather, the elastic and the cahiers but I'm lacking the punch, and wondering which size is best? For the single elastic holes I used a 1.5 mm punch, for the double elastic holes a 2 mm punch, punching from the inside to the outside. You can buy the punches individually as well as in sets. I recently converted a Flex Pocket into a passport size wallet/ traveller's note book. I love the extra pockets this has given me compared with the standard Midori. I've also inserted a Midori card holder/ ziplock to hold business cards and loose coins. With the Flex jot pad, card pen holder and slimline propelling pencil, everything is very compact/ light and fits in one of the back pockets in my cycling top. Really useful in cafes or should I stop to take a telephone call and need to make notes.